In the Scrum.org Headquarters there is a picture of Ken Schwaber — one of the founders of Scrum — pointing at a sticky saying “Done”. 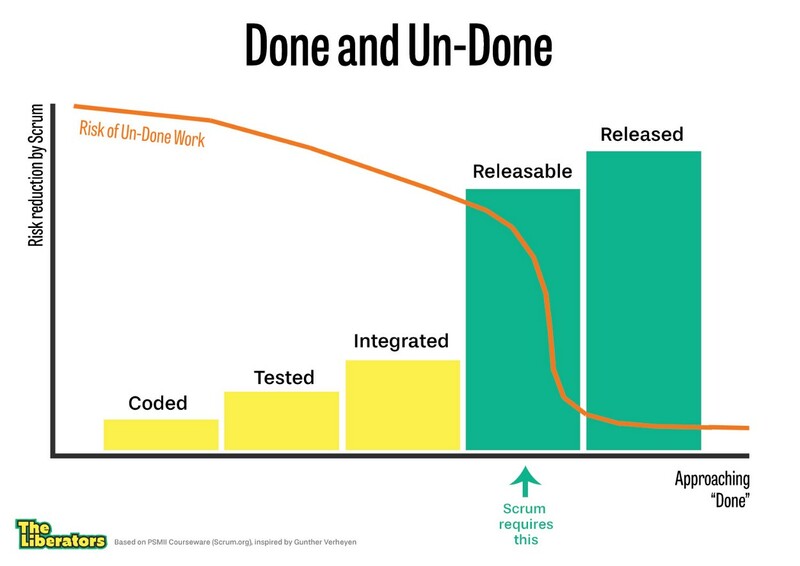 This picture underscores the most essential rule in Scrum: create “Done” software every Sprint. But many teams struggle with this rule. It is tempting to fall into “shades of Done”. An increment is considered “Done” by the Development Team, but requires further testing and stabilization in the next Sprint. Or work is considered “Done” by the Development Team, but the install package still needs to be created. Or work is considered “Done”, but acceptance testing hasn’t been done yet. But “Done” doesn’t support adjectives like “nearly”, “pretty much” or “almost”. An increment is “Done” or it isn’t — there is no gray area. And there is a very powerful, compelling reason behind this: the Scrum Framework only helps to reduce the risk of wasting money and effort when you deliver “Done” software every Sprint. A new version of your product that is, or with the proverbial press of a button can be, released to users. In this post I underscore how essential this rule is to Scrum. What constitutes “Done” depends greatly on context. Building a website for an external customer will require different work then when you’re working with different Scrum Teams on mission-critical software for internal users. It depends on the quality guidelines that already exist within your organization, how critical the software is to the business, the level of involvement of users, the technologies in use and many other factors. Suppose that you are building a new feature for your product as part of the current Sprint. Building this feature requires a workflow of all sorts of tasks, from writing code to creating unit tests, from creating a design to testing it on mobile devices and from testing it with users to integrating it with work done by other teams. And ultimately deploying it to your users. Necessarily, this requires all sorts of skills in the Development Team. And it requires an effective workflow to do all this within a single Sprint. More specifically, the Development Team will move items to “Done” on their Scrum Board when it meets these criteria. The feature isn’t turns out to be unusable by people with poor eyesight — an important group of users — requiring tweaks in the current Sprint. The risk of software development remains high as both the state of the Increment and its features, but also the amount of undone work remaining, is not transparent. We still can’t validate assumptions about features or the product as a whole because it isn’t really “Done”. Taken together, this will erode trust in the Scrum Team over time as stakeholders and management lose confidence in what the team — and Scrum — can deliver. The bigger the gap between what a team defines as “Done” and what is actually needed — the more disruptions and interruptions will happen in future Sprints due to undone work. Not only do these examples illustrate how limiting “Done” reduces your ability to minimize the risk of complex work, it also illustrates how releasing to users early and often is the best way to mitigate risk. It also illustrates clearly how defining “Done” should be a collaboration between Development Teams and Product Owners, integrating both technical and business considerations. In Scrum, a complete definition of “Done” is your most powerful risk detector for complex work. It helps you reduce the risk of undone work by making transparent all that is needed to create “Done” increments every Sprint. It will also make very transparent all the impediments that are getting in the way of achieving this goal. Of course risk never entirely drops to zero. It remains complex, unpredictable work. One could easily add another column called “Value Validated”. But we didn’t want to over-complicate this picture for the sake of this post. It’s not about Scrum, but about reducing risk and maximizing value and making impediments transparent. It might be tempting to throw your hands in the air and consider what Scrum asks of you impossible. But in the world of complex work — which software development is—an empirical process (like Scrum) is the best tool we have to reduce risks and to maximize the value we can deliver to stakeholders. Furthermore, it is the best way to make everything holding you back — like team composition, organizational procedures and bottlenecks — transparent and (therefore) resolvable. And yes, this transparency should hurt. The hard truth is that if you are unable to deliver a “Done” increment (at least) every Sprint, you aren’t there yet. You can congratulate yourself on your journey towards Scrum, but don’t fool yourself by calling it Scrum. Because your ability to detect risks is still very limited, you will see very little benefits of the empirical process that the Scrum Framework is all about. But the good news is that keeping a ruthless focus on creating “Done” software every Sprint will make everything getting in the way of this highly visible. Want to learn more about what Scrum Masters can do here? 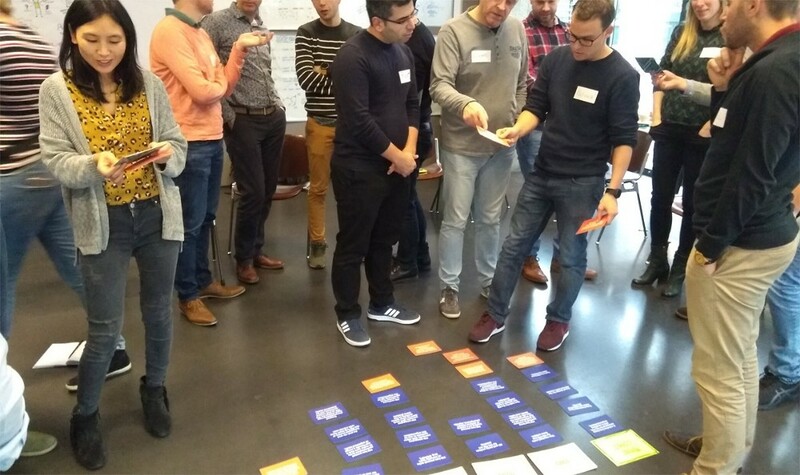 Join one of our upcoming Professional Scrum Master- or Professional Scrum Master II-classes taking place in Amsterdam. We also provide in-house classes throughout the world. Contact us if you’d like to know more.